Software Cinema: FileZilla 對密碼採用明碼紀錄 !? FileZilla 為了方便重新連線到剛剛斷線的 FTP Server, 或是快速進行常用的連線, 會把最近一次的連線資料紀錄在 $HOME/.filezilla/filezilla.xml 的最後面, 在 Last Server 的 Tag 包裹下, 以及最近幾次的紀錄在 $HOME/.filezilla/recentservers.xml 裡面, 在 的 Recent Servers Tag 包裹下 ( 下圖的資料當然全是假的 :p ). 對於 FileZilla 使用來說當然問題不大, 因為只要你能夠用該帳號啟動 FileZilla, 就能夠透過 FileZilla 進行前幾次的快速連線, 看不看的到密碼差別不大. 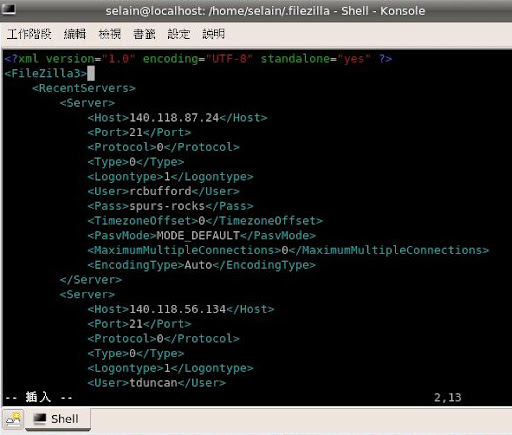 但是以使用者的角度來說, 因為 filezilla.xml 以及 recentservers.xml 這兩個檔案都是一般閱讀權限, 因此只要使用該帳號執行的程式都有相當的機會去讀取這兩個檔案, 這時候用明碼跟編碼差別就很大了. 不知道 FileZilla 選擇用明碼的理由是甚麼 ? 多想兩秒鐘, 其實你可以編一下碼的. This entry was posted on 下午12:00 and is filed under linux , security . You can follow any responses to this entry through the RSS 2.0 feed. You can leave a response, or trackback from your own site.